We have already seen how to subtract number of days from java using calendar and using java 8. Now we will discuss here how to subtract hours from java 8 localdatetime. Some times we will get out date time in string format so we will convert our string format date to java 8 LocaDateTime object. We can user DateTimeFormatter to tell the format of date time to LocalDateTime class. LocalDateTime has minusHours(numberOfHours) method to subtract hours from date time. 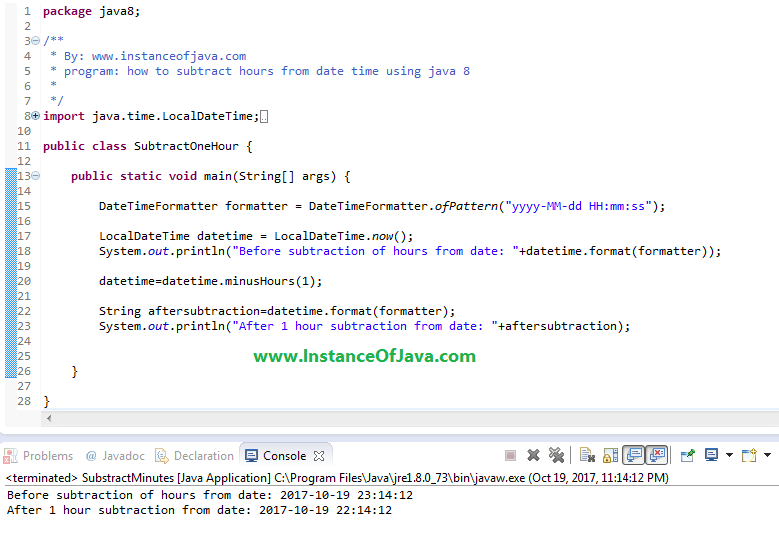 Lets see an example java program to subtract hours from java date time using java 8 LocalDateTime class. How to subtract hours from java 8 date time. Program #1 : Java Example Program to subtract hours from given string formatted date time using java 8. Program #2 : Java Example Program to subtract one hour from given current date time using java 8.